There are many things responsible parents do to protect their children, including buckling them in when riding in the car. Statistics from the National Highway Traffic Safety Administration (NHTSA) show that motor vehicle accidents are the leading cause of death for children between one and 13 years of age. More than a third of children under age 13 who died in passenger vehicle crashes in 2011 were not in car seats or wearing seat belts. You know that these parents’ grief was complicated by regret that they did not insist that their child be safely restrained. Sixty percent of crashes involving children occur ten minutes or less away from home, so they should be buckled up even for short trips. In the news this third week of January 2014 is the recommendation of NHTSA that standards be upgraded for car seats designed for children weighing up to 40 pounds. If the proposed regulation is adopted, child car seats would for the first time have to protect children from death and injury in side-impact crashes. New car seats in this category would have to pass a test simulating a T-bone crash where a vehicle going 30 mph strikes a smaller vehicle going 15 mph. For many years, safety advocates have sought tougher standards for children’s car seats to protect against side-impact crashes. 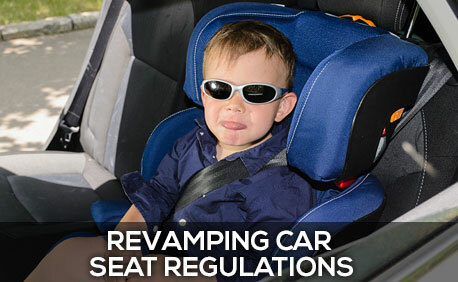 The current regulations for child restraint systems are found in Section 571.213 of the Code of Federal Regulations (http://www.fmcsa.dot.gov/rules-regulations/administration/fmcsr/fmcsrruletext.aspx?reg=571.213). The new regulation proposed by NHTSA won’t take effect immediately. The public will have 90 days to comment on the proposed regulations, then the agency will review the comments and address issues which might be raised; after that, car sear manufacturers will have three years to meet the new requirements. Never use a car seat that is too old. That bargain you picked up at a yard sale may be outdated and have outlived the manufacturer’s recommended usage. Discard a child restraint device if it has any visible cracks in it. You need to read the instructions so you can install and use the seat properly. A used device probably won’t come with instructions. Some of us remember the days when kids piled into the family station wagon and were concerned only with complaining that a sibling was unfairly taking up too much of the seat. But the “good old days” weren’t good in all ways, and we need to take advantage of the modern safety requirements imposed on manufacturers of car seats and other consumer goods.